After one semester as co-campus pastors, LaKendra Hardware and Gwen Gustafson-Zook, are not done teaming up — but this time, the job titles are shifted. When Bob Yoder, the previous campus pastor, left in December to work at Anabaptist Mennonite Biblical Seminary in Elkhart, the college brought in two interim pastors, Hardware (who is widely known as Dr. LaKendra) and Gustafson-Zook. 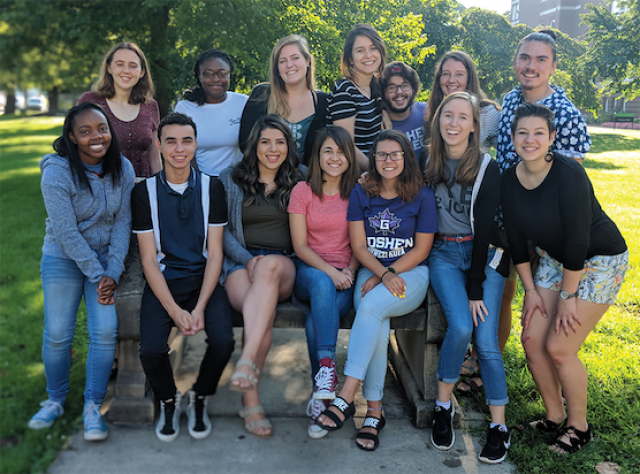 Over the summer, Hardware took on a new role in Student Life, becoming the associate director for diversity, equity and inclusion. While Hardware will continue to aid in chapel planning and other pastoral work, Gustafson-Zook is assuming more direct oversight as campus pastor. Another new development is a revision in the role of ministry leaders on campus. Traditionally, ministry leaders were primarily present in the residence halls to help “foster a vibrant Christian community of hospitality and dialogue,” as the job description said. Already, team members have made strides to make sure they L.E.A.D , by promoting their Bible study, and making their hearts open to ensure that not only Kratz-Miller-Yoder dorm students are accounted for but commuters and others as well — surely showing unity of the community. All of them are working on different projects to try to keep growing the faith on campus — for example, the “Act” subgroup is planning on things like a vigil book to add forms of expression or prayer to help students acknowledge difficult times in their lives. The team itself is diverse. Over this year, the team plans to numerous opportunities for people to “engage their faith,” as Gustafson-Zook phrased it, with chapels, worship nights, table grace, Taize, Bible studies, contemplative prayer, service opportunities and more. “Members of the Student Ministry Team are involved in all of this and much more,” Gustafson-Zook said.